My Experience With Cooking: Carrot Mushroom Soup & an Award! You are here: Home > Appetizers > Carrot Mushroom Soup & an Award! Carrot Mushroom Soup & an Award! Since few days weather here has been gloomy and chilling and what is more comforting than a bowl of bright hot soup? Having run out of sufficient items to fix a proper dinner and feeling too lazy to go for grocery shopping, I had only one choice left-to make a soup. Somehow bright coloured soups seems to brighten me up on a gloomy day and I feel a blast of sunshine seeping through my mind energizing my body, overpowering that extra bit of lethargy! I resorted to making Carrot Mushroom Soup. Though I followed my usual way of soup making I decided to spice this soup a bit more by adding few more ingredients. Carrot soup, if isnt made spicy would tend to taste bland with the slight sweet taste of carrots. I love mushrooms a lot and incorporated those as well. I prefer making soups without cream to save those extra calories and even without cream it turned out like 'Cream of Carrot Soup'. This soup was quite filling and to us this served best as an entree! Heat a large saucepan and dry roast cinnamon and bay leaves. Add chopped onion, celery, carrots, tomato, broth, water, Italian seasoning, garlic salt, pepper, salt and bring to a boil. Reduce heat to low and cook with a closed lid for about 40 minutes or until the carrot pieces have turned tender. Cool and remove the cinnamon sticks and bay leaves. Blend the mixture well. Keep aside. Heat butter in the same saucepan and cook mushrooms well. Add the blended mixture along with milk. Adjust salt and cook for few more minutes until the soup turns creamy. Serve hot with toasted bread or herbed croutons. Instead of vegetable broth, chicken broth may be used. You may add chicken cubes during the first stage of preparation for additional flavour. Milk may be substituted with cream. I'm sending Carrot Mushroom Soup to FIC-Express Your Mood hosted by Nithya of A Culinary Odyssey and started by Harini of Tongue Ticklers. 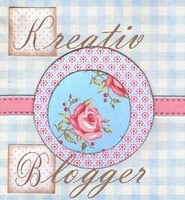 Parita of Paritas World has passed me the Kreativ Blogger Award. Thanks a lot Parita for considering me. This award means so much to me and I'm very happy to recieve it. 1.I did never have a passion for cooking before marriage and used to run away whenever called by my mom to offer her a helping hand in the kitchen! I never even knew how to make an omelette and thought cooking could be done only by skilled people. 2.I love to read cookbooks as if they were novels. I even flip through pages even if I'm tired, for the sole reason of glancing and drooling over the pictures of dishes rather than reading.The sight of a cookbook with a tempting coverpage lures me like a magnet.I find it difficult to memorize any recipe until it was tried innumerable times and often refer my notebook which I have kept aside for the purpose. 3.I find it nearly impossible to stick to a particular recipe because I love adding my own ingredients. Hence the reason for numerous kitchen disasters! 4.I love and respect all cuisines and like having a different dish each time I dine out. 5.If I fall in love with any particular dish I make, I end up making it often until my hubby literally asks me to stop making it. 6.I'm a shopping freak and love to wander around in shopping malls though I end up buying less often. I guess I should say I do more Window Shopping! I do not give much importance to branded stuffs because I believe branding is a way to compromise quality for name(there are exceptions though). Now I dont want to turn off any brand lovers here! Since I'm of the perception that price of goods should be worth the quality,I always go for good quality stuffs at an affordable price rather than branded ones. 7. I become restless until I come up with a solution to a problem..let it be a kitchen experiment or a situation at work place, since I believe that solution to any problem lies buried deep somewhere, waiting to be dug out. People say I have tremendous amount of patience! I guess that is enough bragging for the day. Going on to the next rule of the award ie passing the award onto 7 fellow bloggers, though I would like to pass it on to all my fellow bloggers, I have to comply by the rules here. Creativity is truly a gift of God and I utilize this oppurtunity to pass on this award to the following fellow bloggers. Ambrosia by Mathew. I should say Mathew is creative at words and is a talented cook too. I like his hilarious writeup and the way he aptly describes and presents the dish to the reader. Christo of Chez What. Christo is another talented creative blogger who never fails to amaze me. Each and every post of Christo's have something in it for everyone. Dhanya of My Home Cooking. Dhanya is an expert at cake decorations and she even teaches the basics of cake decorating and is very lucky to have creative and talented students. Do check out Dhanya's dazzling Delights and My Students Works, where she has displayed the work of her students. Lisa of Lisa's Kitchen. Lisa always comes with a tempting, nutritious, vegetarian dish each time and has a huge collection of delectable dishes.I always end up learning something new from each of her posts. Sailaja of Sailaja's Kitchen. Ms.Sailaja always amazes me with her unique dishes. She creates delicious dishes out of ingredients that I could never imagine and has a huge collection of vegetarian, non vegetarian and baking recipes. Vineela of Vineela Siva. Vineela is a talented cook and an artist. She is good at needlework too. She can create a simple yet elegant gift and show pieces out of no where! Her jewellery creations are worth checking out. Vrinda of Sankeerthanam. Vrinda is an expert at baking and cake decorations and her wonderful creations never cease to astound anyone. Kindly accept the award and pass this on to more creative bloggers! Yummy soup. Congrats dear,and thank you so much for thinking about me. I really appreciate it. Will pick it up soon:). Carrot and mushrooms sound like a fine combination! I adore your recipes. Thanks so very much for passing on the award. That's very sweet and thoughtful of you. Wow pooja Congrats for the award and also thanx for sharing the award with me.And so kind of telling abt me dear.U ade my day dear.Sure i will take the award dear. The soup is very delicious dear.U r correct when the climate is little cloudy and rainy that time with hot soup its really awesome.Now me too enjoying hot soup dear. Congrats on the awards! The soup looks lovely and creamy. Perfect for those gloomy days and maybe sunny days, too. Carrot soup is yummy. Congrats on ur award. The mushroom and carrot soup looks excellent, great combo! Congrats on your awards! Congrats on your award. Nice recipe and good to know about you. I love that design the milk has made in the soup. Cool recipe and congrats on the award. U deserve it. Congratulations on the award!The soup looks so yummy. Thanks Dhanya :) I admire your talent! Thanks Lisa & welcome :) I love your dishes a lot! Thanks Vineela & welcome :) Yes its very comforting to have a bowl of hot soup during chilling days! Thanks Jenn :) Yes it turned creamy and I didnt have to add any cream! Yeah a bowl of hot soup is so comforting! Thanks Natasha :) Yes it is..I tried it for the first time and I loved it! Thanks Smitha :) Do try it sometime. You would like this! Congrats Pooja. Carrot soup looks so lovely and delicious. Nice click. Love the presentation of the soup :) looks damn cool! Thanks Mathew & welcome :) Yes this is nice to have on a rainy day. Congrats on ur awrad Pooja and thanx a lot for thinking of me..got the same award from Pavitra also..enjoyed reading abt u,keep up the good work..
Congrats.. the soup looks yummy... like the way the cream has made white swirls in it. Congrats for the award and I must say a very tempting soup and a perfect entry for FIC. Soup looks awesome.Congrats on your award. Thanks Sushma :) Yes dear, since I have refrained from adding any artificial ingredients here, this is great for kids too! your soup looks rich and awesome too.!! soup presentation is awesome.. congrats for ur award!! Hi pooja, Nice soup. What is more comforting on dull chilly day than hot bowl of tempting soup. nice recipe....and very nice clicks ! soup looks amazing dear and congrats on ur award!!!! A hot bowl of soup is always welcome..:).Love the addition of Mushrooms..:). Thanks Bhawna :) Well said! Thanks Preety :) Yes and its highly nutritious too! hi pooja , the soup looks nice n comforting, Congratulations on the award ! Congratulations and thats a wonderful combination for a soup ! Looks lovely..
That's a unique combination. I love carrots so this would be in my 'to-make' list! It is not even close to soup weather her, but still I could have some of this now.. Looks delish!